The Tingley soft-shell has an attached fleece inner layer (since layering is the key to warmth) for an all-in-one that keeps you warm and the Phase 3 breathes at the same time with superior comfort in action. And who doesn’t appreciate the advantages of freedom of movement that come with a little stretch in today’s techno-fabrics? This Tingley jacket can enhance the mobility of any trickster in the half-pipe. The Phase 3 soft-shell design and performance are adaptable to all kinds of athletic endeavors as well – like runners, helpers in the penning area, golfers. And, perfect for all three seasons – spring, summer, and fall – where ever rain or cool winds are elements. Critical thinking and usage went into all this jacket’s protective features. Zippered cording around waist at back cinches out wind sneaking up under the bottom and prevents snow going up the back for those on-hill outdoors wipeouts. An upper outside zippered security pocket stores keys and other valuables, like cell phone and debit card. And for cold hands or other storage options, there are the hand-warmer pockets with zip closures. The longer back provides coverage from rain while the Velcro sleeves can tighten around gloves. The extra coloring of grey is in all the right places – on cuffs and part way up sleeves and on the lower front of the jacket – it’s been well-thought out to conceal dirt in the very places jackets attract it the most! And it can double for work when it’s not in use for athletic events! Okay, okay. We know that wearing high visibility clothing can and should be used more for work versus recreational activities. But, let’s just be honest. If your high-visibility jacket can go from the slopes to the jobsite, well, we think you have a winner there! 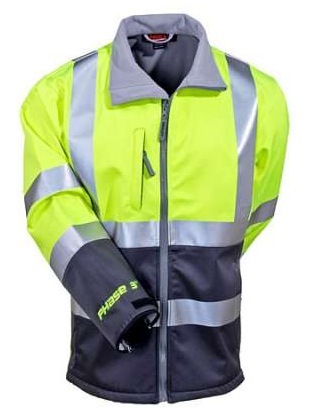 For your own Tingley high visibility Phase 3 jacket, order from WorkingPerson.com. Why? Because we specialize in brands that work!